The Large Landscape Blocks are areas of high ecological integrity that build upon the existing protected areas and serve as the end points for the Critical Linkages. The first step in any connectivity analysis is deciding what needs to be connected—whether these are existing reserves, suitable or occupied habitat for particular species, or large areas of relatively natural land cover (Beier et al. 2008). In particular, running the permeability analysis requires identifying the endpoints to be connected. Usually, these targeted endpoints are defined as large protected areas (e.g., National Forests, State Parks) that need to be connected. However, this approach was problematic for this project. Although there are significant conservation investments throughout the study area, many of the undisturbed blocks of land are not currently protected. In addition, this project seeks to build upon the Conservation Lands Network delineated by the Upland Habitat Goals Project which covers only a portion of the Critical Linkages study area within a 9-county region. Thus, it was necessary to develop an objective, science-based approach for delineating large landscape blocks within the study area that was transparent, rigorous and repeatable and that builds upon the existing network of conservation lands. 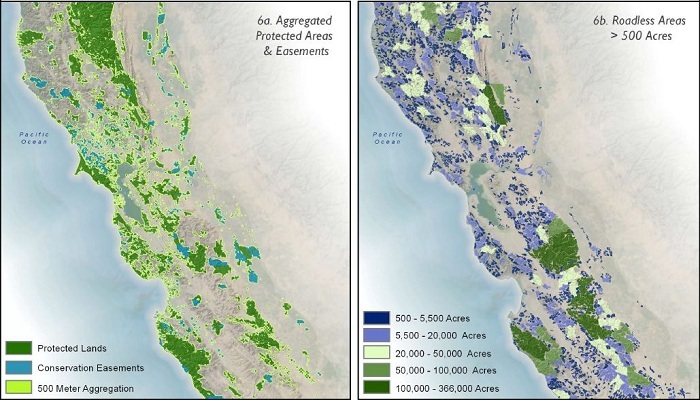 In order to build upon the existing conservation investments in the region, the latest California Protected Areas Database and Conservation Easements (Greeninfo 2010) were used as the foundation for delineating large landscape blocks for the region. We aggregated these protected areas and conservation easements if within 500 m of each other using the ArcGIS Aggregate Polygons tool (ESRI 2010). We excluded easements whose primary purpose was agriculture, farmland, or cultural/historical from this initial step in the analysis. We then removed all urban land from the resulting 500m aggregation to ensure only natural, grazing and agriculture land was included in the aggregation along with protected lands and conservation easements (Figure 6a). We then conducted a roadless area analysis to identify areas of high ecological integrity (Figure 6b). We added any roadless areas greater than 202 ha (500 ac) that intersected this aggregated protected area network (Figure 6c). The next step was to select a size threshold for delineating the large landscape blocks. A threshold of 20,234 ha (50,000 ac) was selected as it captures the size of potential core areas for all focal species except the most area dependent (e.g., mountain lion). 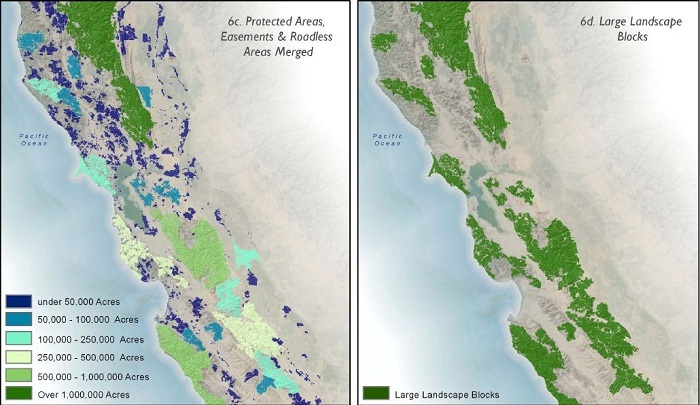 Two potential landscape blocks were eliminated in the Central Valley that were addressed by a previous connectivity planning effort (Huber et. al 2010), A Potential Regional Conservation Network for the Central Valley Ecoregion We also added two areas to the Santa Lucia Mountains block based on input from members of the Linkage Implementation Committee with on-the-ground knowledge of this area and a review of recent high-resolution imagery which confirmed that there were no paved roads in these areas. The resulting large landscape blocks are depicted in Figure 6d.